Pine cones are a perfect holiday crafting material! They’re plentiful, they’re versatile, and you can forage them for free! These glitter pine cone ornaments are a great example of a fun way to turn a simple pine cone into a lovely piece of holiday decor, using just a handful of materials. This project is simple enough to try with your children, and the finished result is pretty enough to hang on a tree, set on a mantle, or even give as a gift. Choose your favorite shades of glitter to personalize these, so that they look right at home on your tree. Now head out and find some pine cones and let’s get crafting! Think about the design of your pine cones and what color palette you might like to try. You can use the following technique to create a single-color design, or to incorporate multiple colors onto one pinecone. If the pine cone ornaments will be for your own tree, consider the color palette of your existing holiday decor while you’re choosing shades of glitter. If you have foraged your own pine cones, you’ll want to clean them up a bit. Start by wiping off any major debris with a wet cloth. Once they are wiped clean, place the pine cones on a baking sheet and bake them for one hour at 200 degrees F. This will drive out any bugs that may be inside, and also open the tips of the cone a bit further. Be sure to remain nearby while baking your pine cones; sap is somewhat flammable and you want to ensure that no pine cones catch fire, although that is unlikely. Using a small foam brush, dip the tip into your glue. A craft glue like Mod Podge or a simple white school glue both work equally well. Press the tip of the brush onto each tip of the pine cone, reloading your brush with glue as needed. Work until each tip is covered with enough glue to catch and hold glitter in place. Place the glued pine cone in a bowl to catch any excess glitter. Sprinkle your glitter over the glued portions of the pine cone, tilting it in all directions until all of the glue is covered by glitter. Once covered, lift the pine cone and tip it upside-down over the bowl to shake off all the excess glitter. Place the pine cone aside in a safe place and leave overnight for the glue to fully cure. Repeat the process for all of your pine cones. Use an ornament hook and wrap one end of the wire around one of the upper tips of the pine cone. Pinch the ends together around the tip to make sure the hook is secure. Alternatively, cut a length of ribbon to use as a hanger. Wrap it around the upper levels of the tips on your pine cone and leave enough length on either end to tie a bow so that you can hang it on a tree. 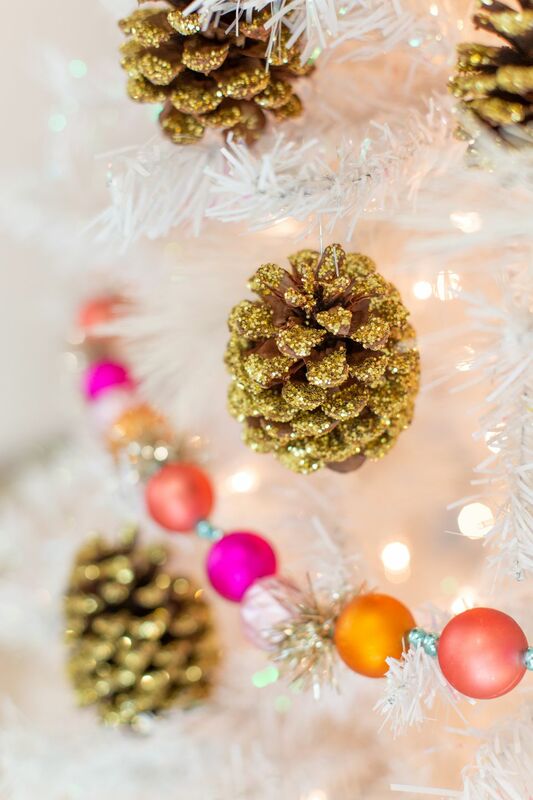 Hang the pine cone on a tree, a doorknob, or string a few together to make a beautiful, sparkly garland. These would make great annual holiday gifts for friends and family as well!